I would love this if I had dry skin, I guess. Having a combination skin, I observed it worked well in my dry areas than in my super oily t-zone. Its very light though but its just not compatible with my oily parts, that's just with me though. It gives a glowy look after application and up to about an hour. Beyond that-it gives a greasy look. But whats good is it doesn't leave a white cast and is blendable; smells good too. This is holy grail sunscreen product. First impression using this is no oily or greasy eventhough cream texture. very easy to absorb and blend. Contain aloe for soothing, Moisturizing, and hydrating effect. Also no scent, so in any condition skin need sunscreen for protect skin from sun. It little white cast but its okay, very thin and disguised. Overall this sunscreen can for all type skin. This sunscreen was good but not the best for me personally. It doesn't leave a white cast but feels quite sticky on my skin since it's a creamy formula. However, it works well under my makeup and in general, I enjoy using cosrx products. I do have to say it does irritate my acne prone skin so I would recommend it to people with similar skin types. 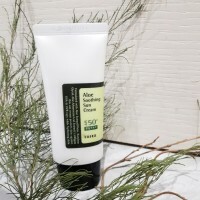 I super love this aloe soothing sun cream.It's not gives a heavy feelings on your skin unlike the other sun cream that I tried before. Since I tried this corsx product I continue using it for my sun cream. I have a very acne prone and sensitive skin but this product really suits my skin type. One of my trusted brand. I really love, love this product! This very gentle to my dry, sensitive and acne prone skin..even if the consistency of this product is thick it will not leave any whitecast. Very soothing to my skin and It smells aloe which i really like. My friends also love it and this is my 3rd tube and i will cont to repurchase it.